picture is the new copy I just picked up on eBay. This will be a bit lengthy. You probably would not be looking at this website if it wasn't for this record. I may not have even ended up with a record collection if it wasn't for this record. I imagine that virtually no part of my life would be what it is now if it wasn't for this record. This is the very first record I ever owned. The picture on top is my original copy that I've had since I was 3 or 4 years old. I have never not had this record going back as far as my brain can recall. I was obsessed with this album. I listened to it nearly every day for years and years. The record player I had when I was a kid was this giant beast. 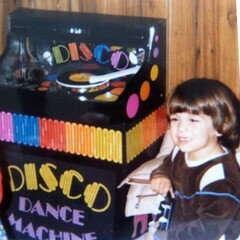 It was called the Disco Dance Machine. It sat on the floor and the bottom half was all speakers. Then on top was the turntable itself as well as a wired microphone so you could sing along. Which I did. Often. Machine record player for my birthday. I made a tape of Briefcase Full of Blues on my Fisher Price tape recorder. It was one of those lunchbox sized tape players with a microphone, so I had to hold it up next to my record player and be really quiet so I could record the best possible version. I would then put the tape recorder in my bedroom window and play it as loud as I could so my neighbors & anyone walking by the house could also hear it. I just wanted to share this music with everyone. One year for my dad's birthday I bought him a copy of this record, because in my head I just couldn't think of anything in the world that would be a better gift than that. This is by far the record I have listened to more times than any other. Sadly, a 30+ year old record, played to death by a 4 year old is going to show some wear and tear. The record doesn't really play well anymore, lots of pops & hissing and a couple of pretty minor skips, but it's scratched up to bits and the cover is severely mangled. Now, I would never get rid of this record, you'd have to pry it from my cold dead hands, but I've been thinking for a while that it was time to get another copy so I can actually listen to this on vinyl again. Well, I was trolling around eBay and I came across a fellow that was selling a copy of the record still sealed! And at a pretty cheap price too. So I grabbed it. Now, this may upset some record collectors, but the first thing I did was open my new sealed copy. I'm not looking for some wacky "Mint On Card" collectible. This record is likely not worth anything to anyone other than me. I wanted a new clean copy to play. My original tattered LP will be the one that goes unplayed now. Sitting down and listening to this record on vinyl again, a brand new copy with no flaws, was amazing. Everything was so bright and all of the instruments just beamed out of my speakers. 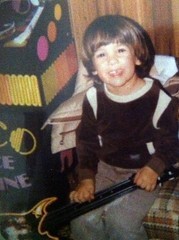 It totally brought me back to being a child, squirreled away in my bedroom, listening to the Blues Brothers. A magic moment. Musically, this album gets a lot of flack from critics & historians. Some call it a joke; two actors singing old songs. But you know, they surrounded themselves with some of the greatest rhythm & blues musicians of all time. This record just smokes from start to finish. The band is so tight, John Belushi is so obviously having such a blast singing these songs and Dan Aykroyd legitimately plays a hell of a harmonica. This record is what opened my eyes to Otis Redding, Sam & Dave, Wilson Pickett and everything that went on in the Stax world of the 60s. Not only that, but it was my very first taste of how a record, how music, could just really affect you. Again, I apologize for the lengthy, somewhat sappy nature of this particular entry, but I just wanted to convey how incredibly important this album has been over the years. Just typing this makes me want to go out and buy more records! Fellow vinyl fan here. I just found your website after searching about the Pixies reissues on vinyl. Great post. Great story. Thanks for sharing.